The curved kitchen allows for excellent design freedom. The proposed model is a composition made up of different elements, each one with its own personality and functionality, creating a well-defined space within which to move comfortably. The focus is inevitably on the central part that houses the large BBQ. 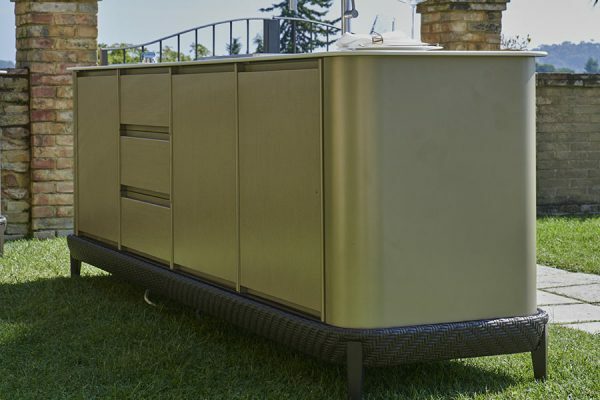 On one side there is a cabinet equipped with a sink and a stovetop and on the other a storage unit. Three perfectly coordinated separate elements that interact with each other and that can be arranged at the client’s discretion. 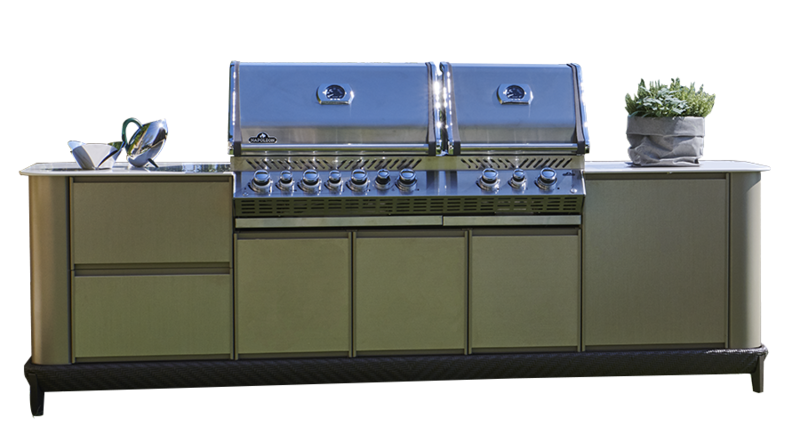 A wide selection of appliances for cooking, refrigeration, washing as well as doors and drawers are available. All with the aim of making the kitchen as suitable as possible for its uses. and would like to collaborate with us? Free standing kitchen. The kitchen has an aluminium base covered in synthetic resin that follows the curved shape of the main structure, with visible feet in a metallic finish. The structure is made of treated iron for outdoor use. 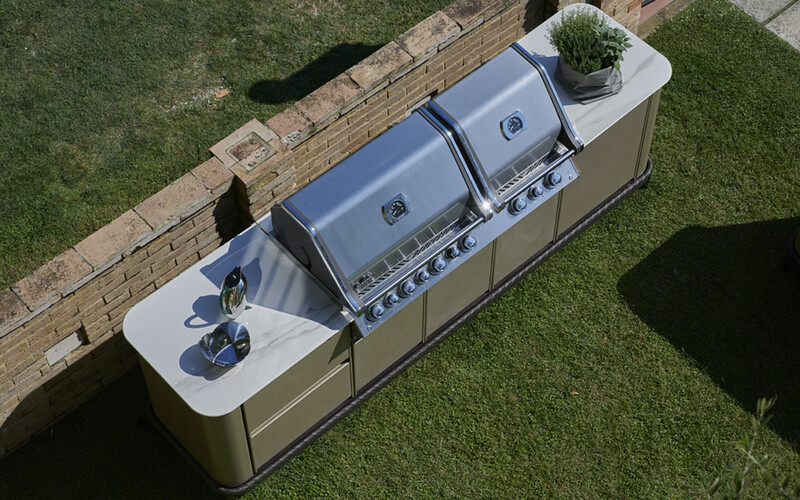 The kitchen modules are made of treated and powder-coated iron that meets the needs of outdoor use according to the international standards Qualicoat Class 2, GSB master, AAMA 26045 and BS EN 12206. 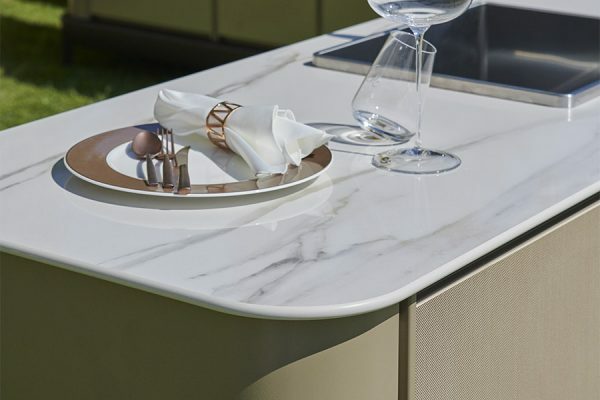 The cabinet doors are panelled with porcelain stoneware with an exclusive metallic finish for a kitchen that revisits the idea of ​​cooking in the open air in an entirely new way. The countertop is made of porcelain stoneware with a marble finish suitable for contact with food; it is stain-resistant, scratch-proof, resistant to atmospheric agents and does not fear the heat or cold. There is a wide range of colours and finishes to choose from, to create the right combination for your space. 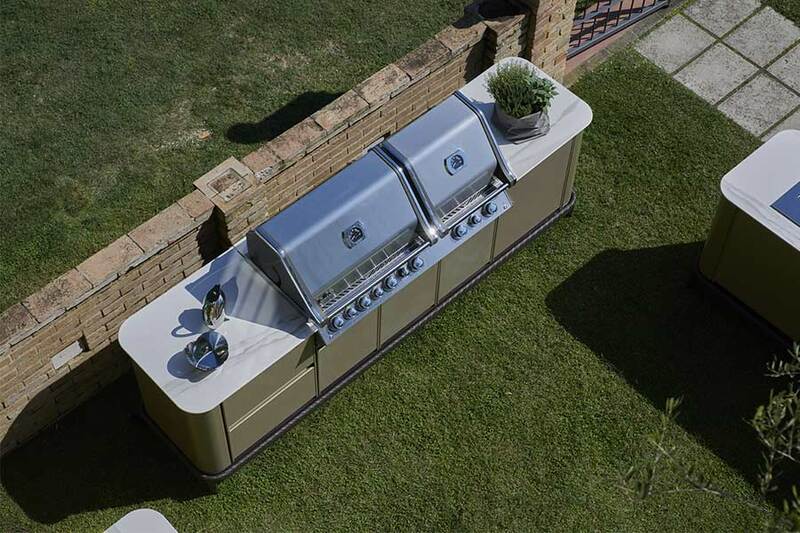 The model presented here is equipped with a modern BBQ in the XL version, gas stove and sink. 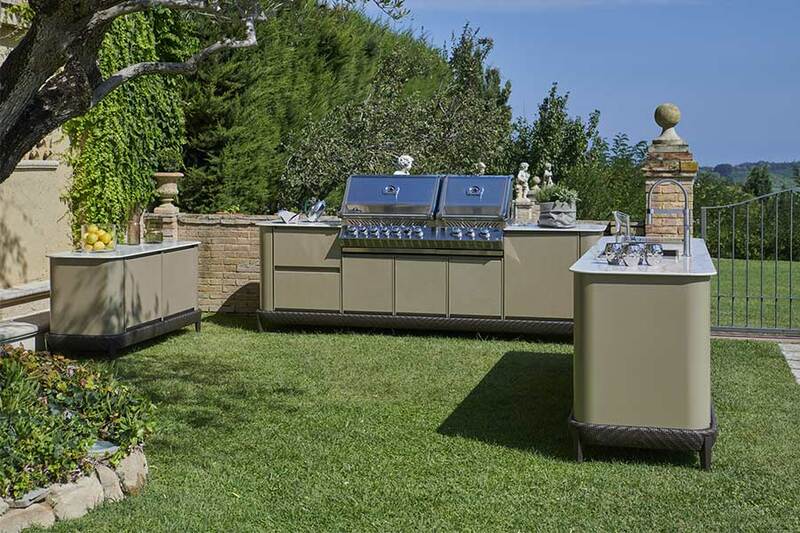 A wide selection of appliances for cooking, refrigeration, washing as well as doors and drawers are available. 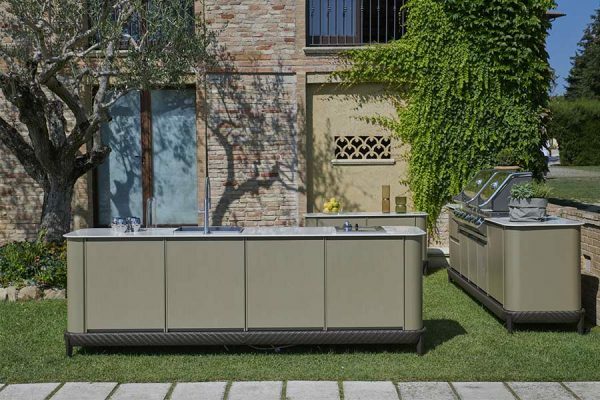 On request, the kitchen can be produced with the predispositions for the household appliances or with the brand of appliances chosen by the client. Everything is down with the aim of making the kitchen as suitable as possible for its uses. 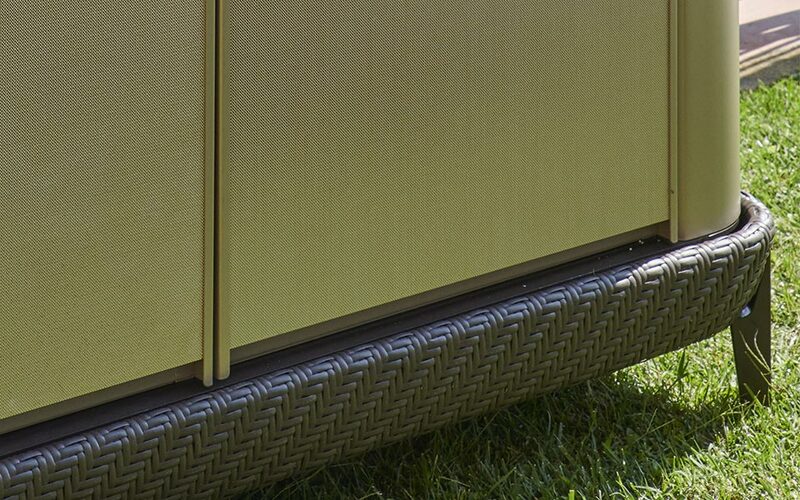 Each kitchen is equipped with a special protective cover made of a distinct technical fabric that is both breathable and water-repellent to protect the kitchen from dust and bad weather during periods of inactivity. 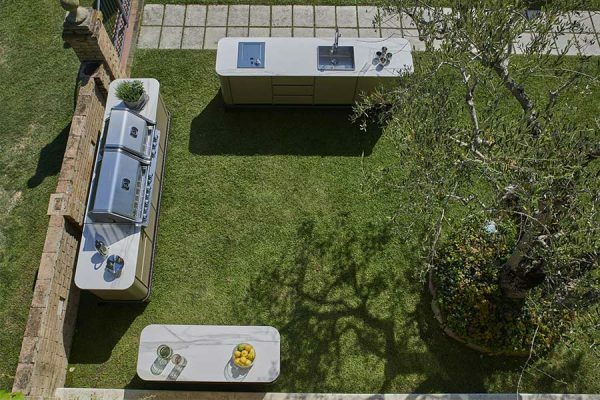 In line with the furniture collection by Samuele Mazza, the kitchen may be personalized by adding modules and accessories in order to fit any client needs.Our technical office can provide support to the client whenever he needs it.